I’m guessing we’ll end this week with a double lock. Not so fast! It’s a tight one – and everyone’s still in contention. Stephanie had a Penultimate Wager, which I dissected later. Bill should wager 11,000 to cover Matthew. Matthew can wager up to 10,800 to stay above Bill if they’re both wrong. Stephanie can wager up to 8,400 to stay above Bill should they both miss. 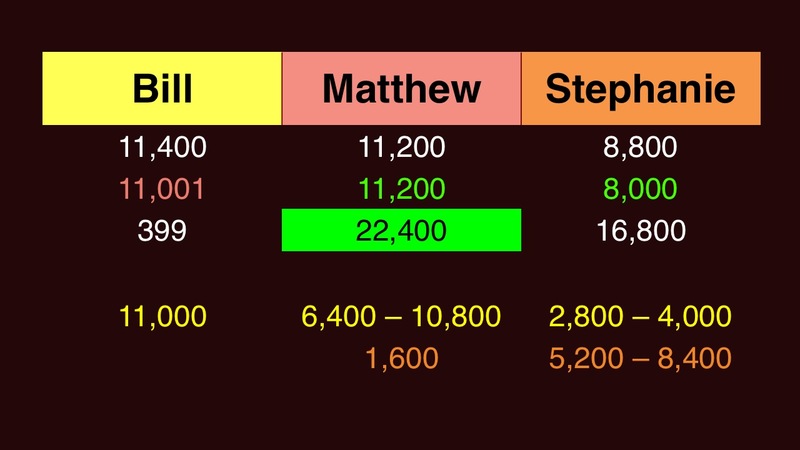 Matthew should wager at least 6,400 to cover Stephanie. Stephanie, anticipating this, should cap her wager at 4,000. Matthew should wager at least 400 to cover an unsafe wager by Bill, although there’s no reason to think he might do this. Stephanie should wager at least 2,600 on the low side, and at least 5,200 if she goes high. Bill shouldn’t anticipate mind games out of both his opponents, so he should stand with the lockout wager. There is a remote possibility he’ll wager the “unsafe” 200, so maybe Stephanie adds that amount to her lower-range minimum wager (instead of just 2,600). No real reason to suspect Bill will do that, though. 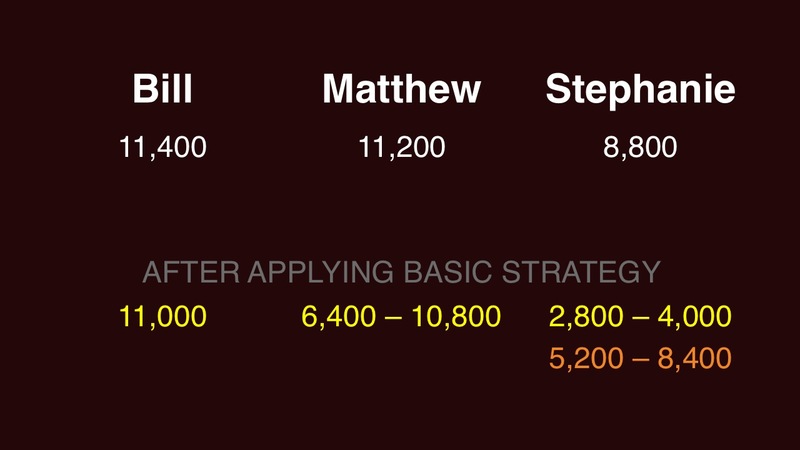 If he thinks Stephanie will go for the 4,000 wager, Matthew might make his new alternative minimum 1,600. Eeeeeee. Bill’s wager is the only one I like here. Regardless, we’ll see Matthew back on Monday! What is Saving Mr. Banks? Hey Keith, pretty sure Stephanie’s min wager is 2,4 not 2,6 – tiny math error/typo probably. Also makes her big minimum 4,8 if I’m not mistaken? Hey Joe – the 2,600/5,200 is to cover Bill. 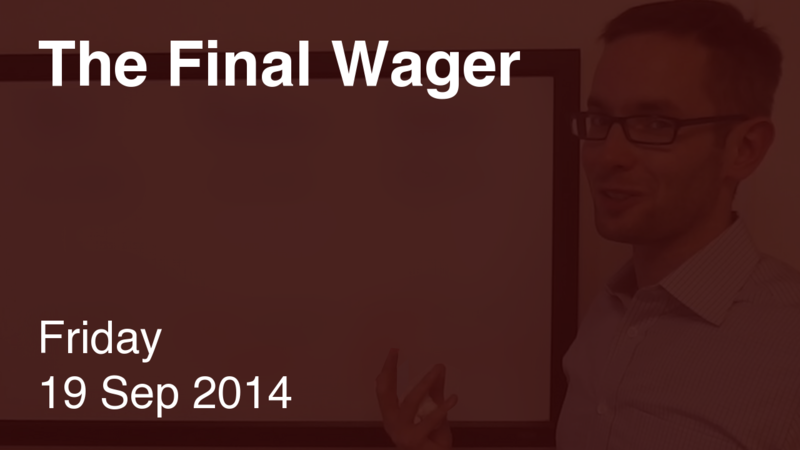 Wow that’s what I get for reading wagering analyses at 3:14 am… You’re right as usual! Agreed, the extra two hundred won’t matter if she gets it wrong but if Bill wagers poorly on the low side (a very unlikely occurrence with two opponents so close in score) she has a shot at seeing a day two. Given your own influence on wagering, if Matthew was facing an opponent he saw for the first time I’d give his all-in bet an orange (same thing with 2nd in other games – but not a dollar less!). Since Bill has a record of adding a dollar on I agree with you here though (maximum optimal wager of 10,800).